Two bedrooms. En-suite bathroom to master bedroom. Family bathroom with bath & shower Open plan kitchen, lounge and dining area. French doors onto decking. Fully skirted in Welsh stone. Two bedroom lodge ready to go - the perfect holiday home or holiday let. Built to BS 3632 Residential Specification. Woodlands Park is open the full 12 month season - 365 days a year. Three bedrooms sleeping up to 7 people. 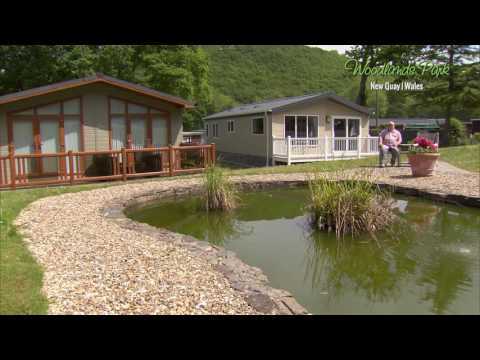 This stunning lodge is the perfect family holiday or home or holiday let opportunity. Woodlands Park is open the full 12 months season. We look forward to welcoming you to Woodlands Park to view our Lodges. Please click the button below to book your park tour now. We can arrange a part exchange agreement on your property, vehicle, motor home, or caravan. Just let us know what you have and you could be the proud owner of a holiday home sooner than you think. (Please note! We can not take your main residential home in part exchange against any holiday home we have for sale).